It’s been a tough year for traffic in the Puget Sound region. A look at the wrecks (or events) that have jammed your trips this year. 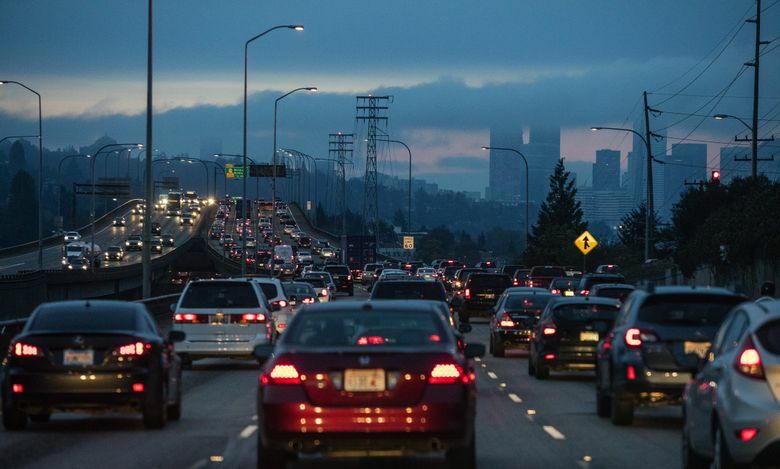 It’s been a tough year for traffic in the Puget Sound region — and it’s getting worse. A look at some of the wrecks (and events) that have jammed your trips this year. A truck carrying fish crashed on Highway 99, blocking traffic. Cleaning up the mess took more than nine hours. Traffic during the evening commute became so backed up that Sounders goalkeeper Stefan Frei, on his way to play in a 7 p.m. match, was forced to park at a downtown hotel and jog to the match. What a warmup. The game was delayed more than 20 minutes. It took about an hour to travel on Mercer Street from Elliott Avenue to Interstate 5. That’s less than two miles. 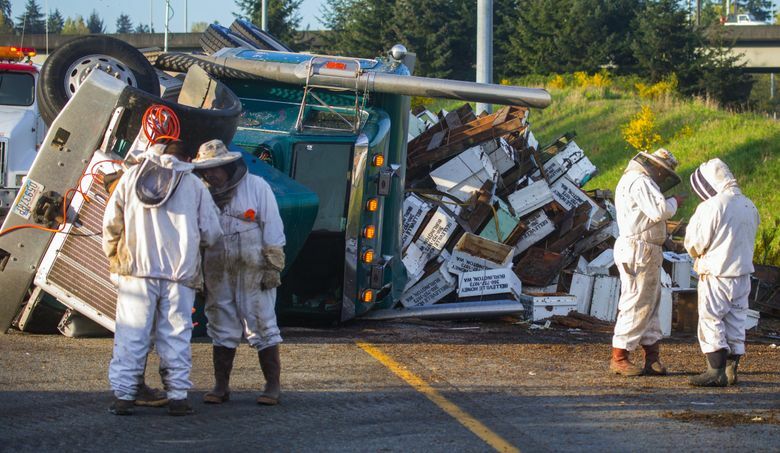 A bee truck crashed on I-5 north, spilling 450 hives and about 14 million bees. The overturned truck’s front-left axle and wheel were mangled in the wreck. Clumps of bee carcasses littered the roadway. Gawkers on both sides of the highway held up traffic for several hours after the wreck was cleared. A pickup driver dropped his cellphone and tried to grab it while driving near downtown on I-5. When he looked up, he couldn’t avoid slamming into a car ahead of him. The pickup caught fire and blocked the entire roadway for a short stretch. Two men were seen lighting fires alongside Interstate 5 in Snohomish County during one of the driest summers on record. The fires caused an 11-mile backup on I-5. 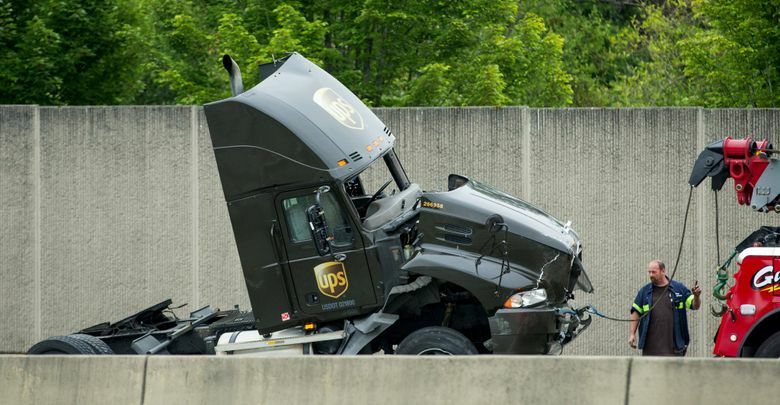 A UPS truck carrying packages spilled its load on the shoulder of Interstate 5 in Tukwila, causing an eight-mile backup. An expansion joint on the freeway had to be repaired. The Chinese president and his 1,000-person entourage disrupted traffic wherever his motorcade went. A nine-block section of downtown Seattle was blocked off for the president’s security. 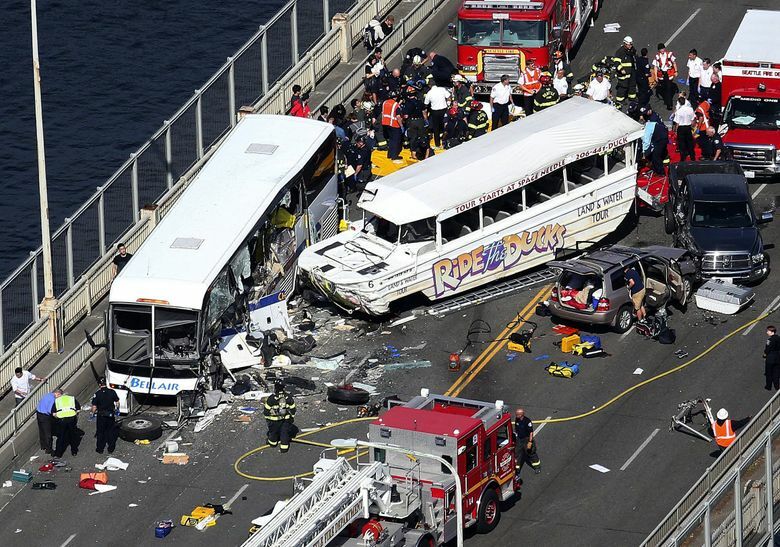 A Ride the Ducks vehicle collided with a charter bus on Highway 99’s Aurora Bridge. 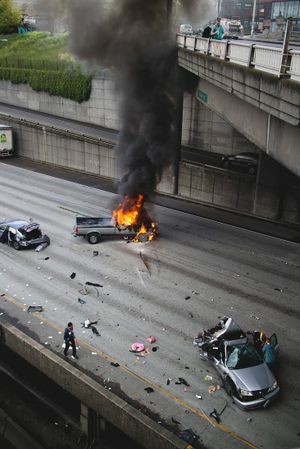 Five North Seattle College students died as a result of the crash. The wreck jammed up traffic throughout the region. A woman driving a stolen motorcycle slammed into the back of a vehicle on northbound I-5 approaching 520 at more than 100 miles per hour. She was thrown from the bike, which slid about 400 feet and caught fire. Two crashes jammed traffic on northbound I-5 so badly that the drive from SeaTac to Seattle took more than an hour. 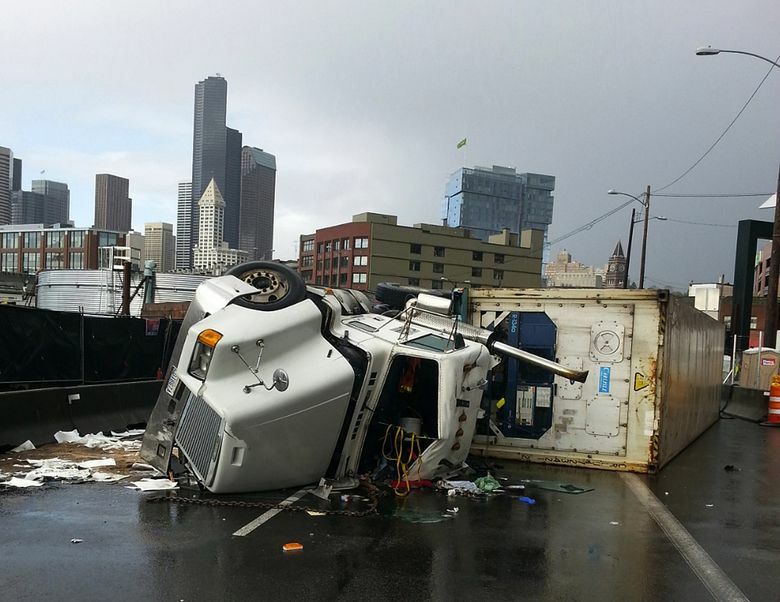 The first crash left a truck dangling over the edge of an elevated portion of I-5. In the second crash, a pear truck rolled over near Federal Way and blocked several lanes. 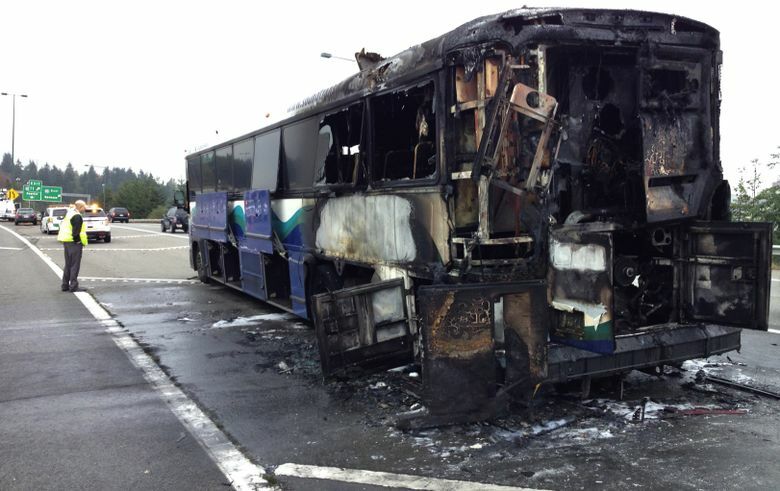 A Sound Transit bus caught fire on I-405 after a pop was heard by passengers. The driver pulled the bus off the road and evacuated all of its passengers to safety before the Sound Transit vehicle became engulfed in flames. Luckily, a Bellevue Fire Department Inspector was on board the bus and able to help the driver keep passengers safe.